On the right side of the Timer fields, your total earnings will be displayed. 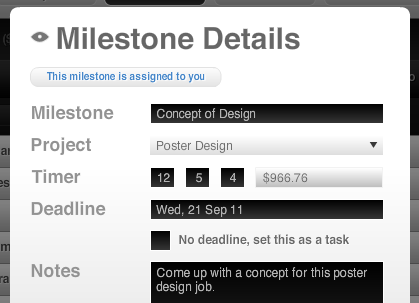 This is a multiplication of your hourly rate by the total time spent on this milestone. The project editing window went through some changes as well. Project Timer: This remains unchanged. 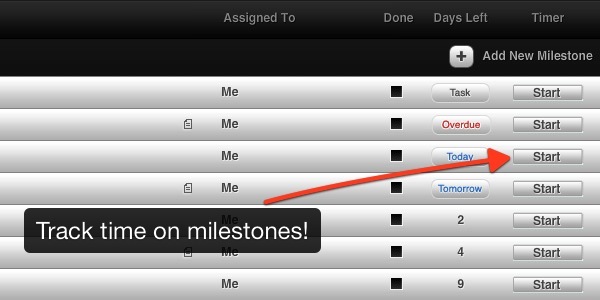 The project’s timer is independent of its milestone timers. If you’ve been using the project timer all these while, you can continue doing so without changing any habits. 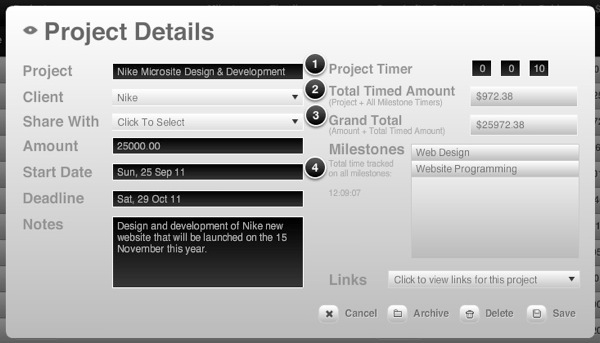 Total Timed Amount: This amount is calculated by adding the project’s timer values to the total time tracked on all milestones. Previously, if you add multiple clients of different contacts but with the same company’s name, there is no way to tell which is which when selecting a client from a drop down menu. We solved this problem by adding the person’s initials beside the company’s name. We’ve adjusted all fonts for better readability when they are white on black, especially on form fields. We hope this small adjustment provides you with a better reading experience. That’s all for now, hope you enjoy this update! The timers and better legibility are great! But the multiple clients feature……. ? What on earth? Creating multiple clients was just a dodgy and inconvenient work around for adding multiple contacts for one client. In our experience a ‘client’ is a company, and in many cases we have multiple contacts at one company who we send quotes and invoices to. Just adding the initials to a client name still means we have to create multiple client entries for one client…. It bulks out the client list and means we would be scrolling for ever to find a contact at a client. Also, when it comes to sending out quotes/invoices to multiple contacts at the same client, we have to open up our address book or email client to copy and past the email address in….. Please tell us this initials thing is just a temporary fix until you sort out being able to add multiple contacts to one client. Still loving Subernova, but was really hoping for a better solutions for multiple contacts. @sam it’s a fix to solve the problem of selecting a client of similar company name from a drop down menu. Yes a better solution for multiple contacts will come.